There is a very good chance we witnessed the top in bitcoin when it hit just under $20,000 in December of 2017. The rapid price gains it achieved last year officially put it in the record books as the largest bubble ever recorded, exceeding even the Tulip Mania of 1634-1637. With the amount of attention bitcoin was receiving last year, the fear of missing out and level of irrational exuberance had become so strong that even the most risk-averse clients of our firm began calling to buy bitcoin in their accounts. 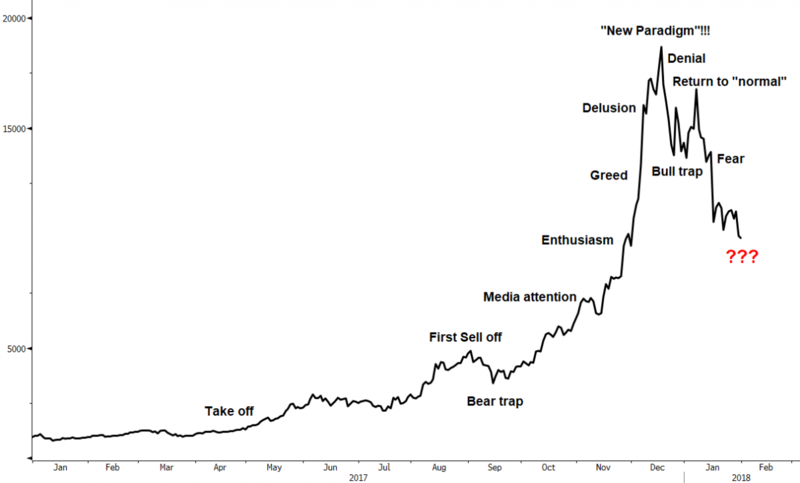 As we communicated on our podcast at the time, just weeks before the final peak (see Frothy Signals Suggest Caution), it was clear to us that we had reached the final throes of a late-stage parabolic move similar to the public euphoria surrounding tech in 2000, US housing in 2005, and precious metals in 2011. Where does bitcoin go from here? We start with the general framework for assessing a bubble as it evolves through various stages as presented below. 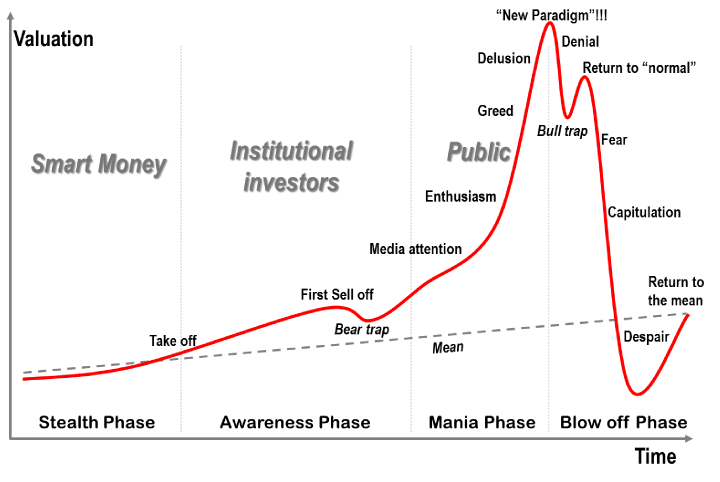 Though the chart above doesn’t attempt to capture the exact price movement of every single bubble, it’s quite amazing how closely bitcoin has lined up with this template so far. 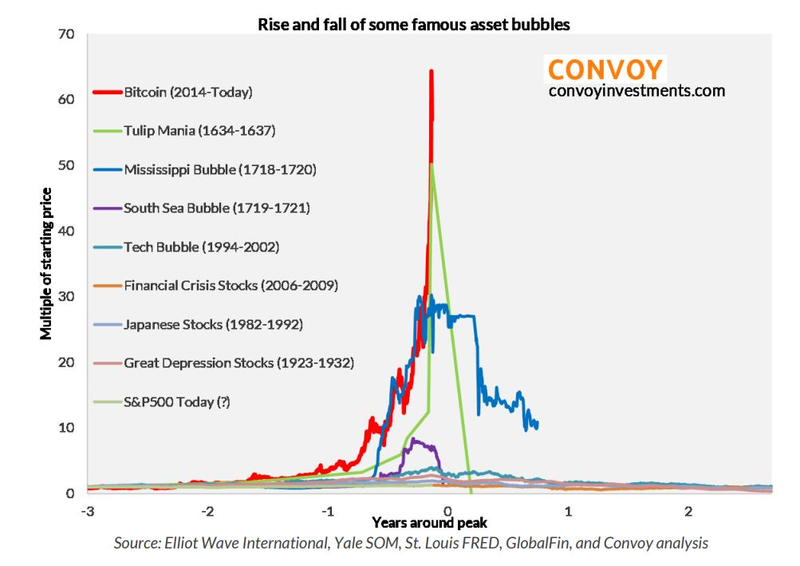 Looking at the Tokyo bubble of the 1980s and the tech bubble of the 1990s provides a possible clue as to when the bottom in bitcoin may occur. From peak to trough, they both took about two and a half years to see a bottom develop. Given how rapid the appreciation in bitcoin occurred (roughly one year), these may not be the best examples to use however. In that case, we consider the Chinese Shanghai Stock Index bubble seen in 2015 and the silver bubble in 2011. While the price gains pale in comparison, their shorter duration may provide a better roadmap for bitcoin. Silver peaked April 25th of 2011 and then placed a major bottom on December 29th of that same year—178 days later. The Shanghai Index peaked on June 12th of 2015 and bottomed on January 27th of 2016—162 days later. Overlapping the two with the recent peak in bitcoin suggests that an initial bottom may occur around August of this year. Though we don't currently hold any bitcoin or cryptocurrency-related investments in client portfolios, once the blow-off phase completes and our bitcoin valuation model reveals another buying opportunity is at hand, we may look to scale back in for some of our more aggressive clients. For more information about Financial Sense® Wealth Management, our investment models, or investment services, click here to visit our website.